Bluehost is arguably the most popular hosting company on the internet yet I, and many others, no longer use them. As a blogger I have worked with several web hosting companies and have for five years. Web hosts are literally vital to my businesses success. Downtime means I’m losing money and followers. During my time with Bluehost I had substantial periods of downtime, lost an entire website at the fault of Bluehost (hundreds of hours of work) and experienced horrible customer service and wait times of LITERALLY hours. As an early blogger I had found Bluehost recommended by Pat Flynn, who I had been following and decided to give them a shot. Now no shade on Pat Flynn, I do believe that especially in the beginning he did use and loved Bluehost. I also happen to know however, that he doesn’t use Bluehost on his main website… to me that does say something. But I regress. I picked up a Bluehost plan and paid for three years. I decided when I signed up to buy Bluehost’s backpack services, so that if anything ever happened I could have my site restored. The first year I had dozens of instances of downtime. Then, at the end of that year, after hundreds of hours had gone into my website, it disappeared-all that was left was a white screen-the white screen of death. I spent three hours waiting anxiously to speak with customer support (they claim an average wait time of 11 minutes), and then was told that they LOST my backup and the only thing they could do would be to delete WordPress and I could start over…..
That’s right, they told me the service I had paying extra for-for a year- hadn’t worked correctly and everything was gone. The representative was unapologetic, unhelpful, and eventually told me that she had better things to do then continue talking with me. What?! So, I fixed the problem in spite of Bluehost. This is not an isolated experience. I had dozens of other horrible experiences with Bluehost and TONS of people had had similar experiences! Just go onto Twitter and enter #bluehostdown and you’ll see a tons of unhappy customers. Beyond the actual service (which was not great) I had a lot of issues with Bluehost adding on services I didn’t want and charging me for them like their Sitelock service. I also had hosting renewed that wasn’t supposed to renew. Interestingly enough, when I complained about this, it took me DAYS to hear back (I think 5 exactly) and another few days to get my money back. Why Is Bluehost So Popular If What You’re Saying Is True? I very strongly believe that Bluehost having a good affiliate program is one of the reasons so many people promote their services. Affiliate programs work by allowing you (the blogger) to recommend your favorite products and services and get paid a nice commission. This is great, unless people abuse that, and promote things that aren’t so great because they’ll get paid a lot of money. Bluehost offer $65 per sale. Now, to put this in perspective, the average on most affiliate hosting deals is $50ish. So, while $65 might not seem like it would be worth it to promote a worst host and get $15 extra, you also have to look at popularity. Bluehost is already popular. Where a normal conversion rate might be %3, Bluehost is (from what I’ve heard) around 10%. That means that you’ll make a LOT more money promoting Bluehost than a not-so-well-known-but-much-better-host. Just to throw some more numbers at you. If you were to promote SiteGround (my preference) for $50/sale at a 3% conversion rate you’d be looking at $450 per 10,000 visitors to your site. If you were to promote Bluehost you’d be looking at $6,500. Now, if you’re wondering why online influencers promote Bluehost if it’s so horrible…. Just look at their income. Pat Flynn makes on average $40,000 a month from Bluehost affiliate sales. And It’s not just Pat Flynn, the list goes on and on and the truth is that most of these larger people don’t use Bluehost on their main sites. So, why not ditch Bluehost on principle? Perhaps because Bluehost is so popular that it would take a large movement to affect Bluehost at all and in the process of ditching Bluehost you might greatly injure your reputation. With the popularity of Bluehost come some other issues. First, bloggers who are just starting out are likely to recommend Bluehost because they trust the influencers that they follow that recommended it to them. Bloggers who have no real experience blogging, but want to make a cut of the pie, will go with Bluehost because it’s the most well-known and has good conversion rates. 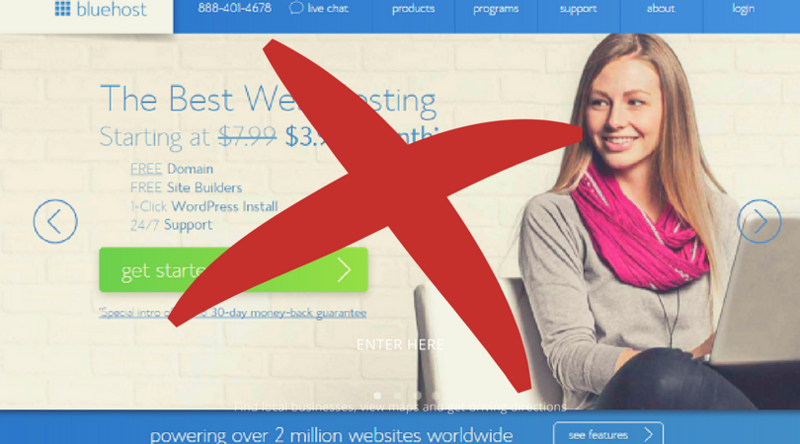 Bloggers that have low standards will continue profiting from the high conversions and will be unlikely to stop using Bluehost. Because of this cycle, Bluehost continues being popular despite it being a horrible host. Also if you think for some reason I’ve made all of this up I would challenge you to move beyond the first page of search results (remember a lot of them are getting high sales commissions) and really dig into what other people are saying. I personally ended up leaving Bluehost after my first year, even though I’d paid for three years. Don’t be like me and waste money! I use SiteGround, you can read about I’ve chosen SiteGround here. You can also learn how to set up a blog here.